Recently, the students of team WARR set a new speed record, hitting 201 miles per hour at the Hyperloop Pod Competition. 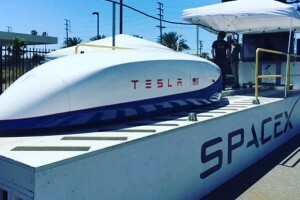 Their record didn’t hold up long however, as Elon Musk’s Tesla-branded Hyperloop pod reached 220 mph earlier this week, taking place on the same .8-mile-long SpaceX test track. While impressive, neither pod is close to the hypersonic speeds Musk hopes to achieve with the Hyperloop, although he strongly believes he can “get past 500 km/h (about half speed of sound) next month with a few tweaks or maybe tiny pieces,” as noted in the Instagram post below.